The first violin part for Beethoven's Symphony No. 2 in D major, Op. 36 has been edited by Ilya Kaler, who has appeared as guest concertmaster with the San Francisco Symphony, Philadelphia Orchestra and Baltimore Symphony. Kaler's bowings, fingerings and other editorial markings have been added throughout the score. The Second Symphony was mostly written during Beethoven's stay at Heiligenstadt in 1802, at a time when his deafness was becoming more pronounced and he began to realize that it might be incurable. The work was premiered in the Theater an der Wien in Vienna on 5 April 1803, and was conducted by the composer. Beethoven's Second Symphony substitutes a scherzo in place of a minuet, giving the composition even greater scope and energy. The scherzo and the finale are filled with Beethovenian musical jokes, which shocked the sensibilities of many contemporary critics. Download and print the score today to gain access to expertly edited Beethoven Symphony No. 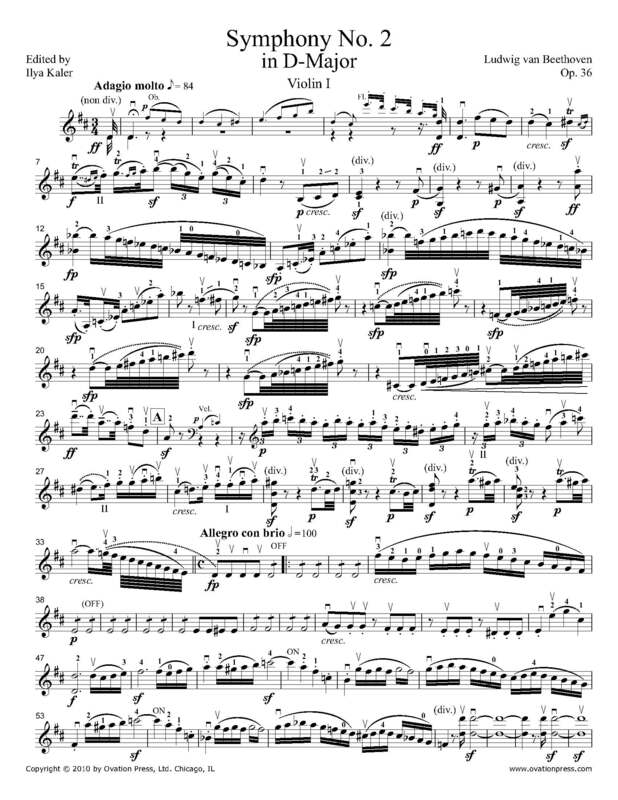 2 violin fingerings and bowings from Ilya Kaler!